This is a great model released in 2017 by LG. 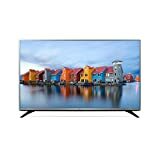 It is one of their great Full HD 1080p LED TVs with the display size of 49 inches. Why go for a conventional High-Definition TV when you can enjoy improved picture, sound, as well as connectivity on this stylish 49-inch LED TV? This amazing 49 – inch LED TV has incredible picture quality that will make your viewing experience better than you can imagine. It allows you to relax, have fun, and enjoy watching your favorite TV shows, movies, sports, and more on this amazing screen. By switching the Real Cinema 24p mode, you are able to view movies and shows the way they are meant to be. It is also great for playing games, so all those game lovers will probably be thrilled with the way their favorite games look on the LG Electronics 49LF5400’s screen. The entire TV set including the stand measures 1103 x 698 x 198mm, so you can set it up pretty easily. A contemporarily designed TV stand securely props up the TV set upright. If you are looking for a HDTV, the main reason for that is probably the big step forward in picture quality. This TV will deliver that in a big way. It is an amazing Full High-Definition 1080p LED TV, so it meets the highest standards for great high definition, and it displays 1,080 lines of resolution on the screen in order to deliver more detailed and clearer image that is simply stunning. Brilliant LED backlighting display like this one delivers true blacks, crystal – clear images, and life – like, and more vivid colors on a slim screen. The LG Electronics 49LF5400 supports a 1080p video mode, and a display resolution of 1920 x 1080 pixels. A comprehensive indicator called Motion Clarity Index indicates the genuine clarity of rapid motion display, and it incorporates factors beyond just frame rates. LG’s powerful engine, advanced local dimming, and detailed backlight scanning all add to an amazing performance in reducing blur in fast-moving scenes and pictures.This is why this TV is a really great choice for all those who love to watch fast-action movies, sports, or play games. Stunning images on this TV are complemented by the great sound it produces. This model has two 10W speakers, and the speaker system on the 49LF5400 comes improved with Clear Voice II technology and Dolby Digital Decoder. These two speakers generate an extended sound field putting everyone in the room in the center of all the action. This great LED TV’s Smart Energy Saving feature makes use of great, intelligent technology in order to reduce the overall energy consumption of this set. The brightness of the TV is controlled by the Backlight Control function. You can switch off the screen while leaving the audio on thanks to the Screen Off function. Also, you are able to set your television to a power saving mode that uses zero electricity thanks to the Standby Mode Zero function. Save the environment, as well as your money by conserving energy with this great, advanced TV. Motion Eco Sensor technology will automatically adjust the brightness of the screen depending on the speed of the images. This TV doesn’t have Smart features or a built-in WiFi, so all those who are looking for a Smart TV should probably take this into consideration. However, there is always possibility of connecting one of the many amazing streaming devices that are available on the market nowadays such as the Roku Streaming Stick, Fire TV, and more. Those devices will fit discretely into any TV that is equipped with the HDMI input. Speaking about that, is wouldn’t hurt to mention that the LG 49LF5400 has two HDMI inputs, and one USB input for connecting your media devices.